This is how the car stands currently. The next 30 or so posts are my thread from over on PUK. It's a bit long, but since I'll be updating soon and for completeness I'm going to copy it over. Well, this thing seems to be turning into one, so I thought I'd start a project thread. I've had this car for about 4 years; it's a very early JDM 1991 4th gen Vtec. Except for the blacked out windows, it was totally stock, but in quite bad shape. 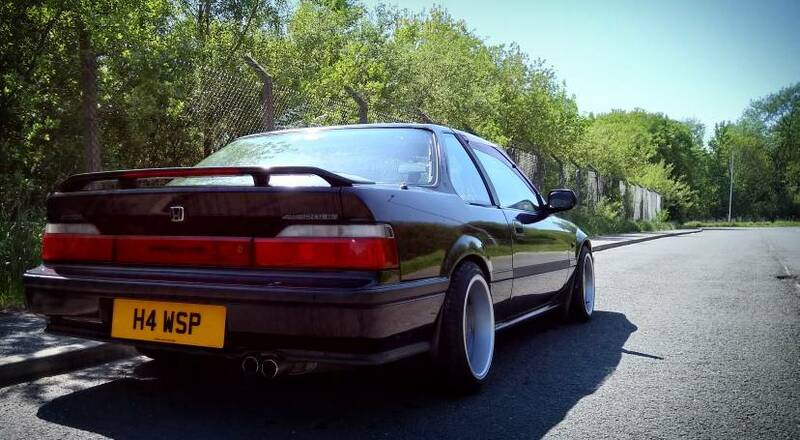 Anyway, towards the back end of last year the Lude started playing up generally, consuming oil, rattling over bumps, idle issues and other little things. I fell out with it! Right, that's it, the last straw. It's going. So I went out and bought a '97 Saab 900 turbo convertible. I couldn't offload it in PX, so the Prelude just sat there rotting for the next few months. Then it came to the point where I had to get rid of it, so I tidied up a little, and fixed the front end. Charged the battery, put the key in and......................it started first time. I took it for a spin and suddenly realized that it was a far better car than my new one; far, far better. I'd fallen in love all over again. So, I sold the Saab, and bought a 1993 civic 4 door auto to run around in (mmm nice). And over the last few months I've been amassing some bits to sort the Lude out. The missing prelude rear brake light. Amber front indicators and repeaters..
A spoon modded P13 ECU. A Harmon Kardon drive and play kit. A UK fog light switch. A replacement folding wing mirror. A new space saver spare wheel. A cam belt and engine gasket set. A full inlet manifold and throttle body to clean up and paint. A HID bulb kit (6000K). A front wing to repair my rotting rear arch. I'm sure there's more but I can't remember right now. So, somehow, between parking it up and falling for it again, it had decided to develop a crack in the windscreen, so I had a new one fitted. UK Blue rather than JDM Bronze due to the shocking cost difference. The blue seems much clearer to me, I like it. I bought these wheels recently and decided to spruce them up a little. They looked good from a distance , but a little tatty up close. So, I started by getting grid of any corrosion, which took ages by hand and dremmel, if I was to do this again I’d get them blasted clean. I spent at least 3 hours a wheel in prep time! Next I filled any marks, rubbed them down to as fine as 240’s paper allows and coated them in etch primer. I coated them in normal primer. This I applied 20 mins after the etch layer. I left them a few weeks, waiting for a nice sunny day. Rubbed down with 1500’s wet dry paper and cleaned thoroughly with panel wipe. Then I painted them with ford moondust silver, 3 coats, one light mist coat and 2 nice ‘good’ coats, leaving 15 mins dry time between each. The easiest way to get a nice finish is to use 2 pack lacquer, applied well it doesn’t even need a polish afterwards. Out with the compressor and stuff. The mix for the lacquer was 2:1 with hardener, and I threw about 10% thinners in there as well. The paint is applied in the same way as the base coat, one mist coat, followed by 2 good coats, leaving about 30mins between each coat (this may differ depending on the ambient temps). And here’s how they turned out. Anyway, After I refurbed the wheels I then painted the front bumper. When I did the bumper I filled the holes for the front badge and relocated the front number plate for a cleaner look. Next, came the brakes, which were in a pretty bad state. They were never great and sitting for so long hadn't helped. Getting the old lines off was difficult, they were rotten and stuck solid. So, I used BH detox gel, it did a great job left overnight. I stripped the brakes down and left them in some liquid Bilt Hamber Detox C stuff overnight. Then I put new seals in and gave them a lick of paint. I think they came up pretty well. Next job, one of the rear wheel bearings was making some awful noises, I wonder why? An easy swap I thought, how wrong! Half of the bearing had decided to stay right where it was. Pretty much every job I undertake on this car ends up being a job and a half. So out came the angle grinder and the battle commenced........I won, but as you can see, only just. So, on are the new wheels and brakes, new bearing and the third brake light. While all this has been going on I've also been cleaning up the inlet manifold, or should I say my girlfriend has! Things I have already fitted that are probably worth mentioning are some UK EL dials, lowered springs, stage 1 clutch and Goodridge clutch line with no damper, ebay manifold (stop gap), decat, AEM underdrive ancillary pulleys and blue leds in all the switches. So that's where I am right now, still yet to put it through its MOT, but thankfully the Civic means I don't have to rush too much. Good job really as I work so slowly. I'm so glad I couldn't PX it. It would have been broken or crushed by now. Last edited by Vtecmec on Fri Jan 02, 2015 7:47 pm, edited 6 times in total. I test fitted the head unit to make sure it works. Thankfully it does. Right, onwards and upwards, or not as the case may be! I had a few days off work, and decided to tackle the rear arches. Let's start with the o/s I thought, it looks the better of the two, the other has had a past repair and could be quite nasty. So, this is how it looked to begin with, no too bad I thought. even worse after poking round with a screwdriver, still I’m sure it's fixable. This looks pretty terminal, I'm gutted, I think it'll take a lot of work to sort this out, and I don't have a workshop, also this is the better side of the two, god knows what's behind (or not!) the other skirt. Last edited by Vtecmec on Tue Mar 19, 2013 9:30 pm, edited 1 time in total. Sorry for the big post, I really need to update this more often. Towards the back end of last year I had a go at the arches and sill, all was going well until the damn thing caught fire! In a big way. Only for the fact that there were builders working next door with lots of buckets of water and hurrying around, is the car still here. Serves me right for cutting corners and not stripping all the flammables away before welding. The pics say it all. One step forwards, ten steps backwards. Super gutted. Then the weather turned and I parked it up for the winter, leaving the arch in it's decimated state. Anyhow, that brings us up to date, Iv'e been off work all week, the weather is marginally better, and thought I'd have another stab at it. The back screen has come up surprisingly well, with the only damage to the outside weather strip and the interior trim. It took me ages to properly clean the inside of the quarter though; I've cut out all of the damaged metalwork, than painted the inside of the quarter with a telescopic lance and given it a thorough waxoyl. Then the rain started so, not wanting to stand still, I moved onto the interior by fitting a 'new' mid facelift console and centre seat section, and at the same time half fitted the ipod kit underneath it. I also fitted the controller where the hazard switch normally sits, I thought it would look cool; but now I'm not so sure, also went on the leather gear and handbrake gaiter and new leather gear knob. Seeing the inside looking a little better, I decided it was about time to attempt to fit the civic steering wheel I'd bought, it's the same size as the prelude wheel, but a little chunkier, and I think a bit better looking. First cut a piece out of the prelude wheel. Then cut a piece out of the civic wheel as in the picture, it was easy to see where to make the cut by laying the prelude wheel on the civic one and marking it with a scribe. And in the same pic you can see that I welded the piece I cut earlier to the civic wheel, this is where the cruise buttons mount. I guesstimated its position, and modified the weedy button bracket to suit later. The rear of the wheels are different and without modifying won't work with the car, I got round this problem by cutting off the back of the civic plastic cover and doing a similar thing to the prelude wheel. Then mating the two together. Yet to fit the wheel, but I can't wait to try it on. I also got round to welding a new inner arch and a few other bits in the damaged area, but I have yet to get the outer arch piece on (damn weather). Last edited by Vtecmec on Tue Mar 19, 2013 9:31 pm, edited 1 time in total. Here is a pic of it fitted. Before testing it I gave the engine a bit of a mini service, changing the air filter, oil and oil filter and fuel filter. After not being run in about seven months, it just started first time; awesome. Though it looks like its leaking plenty of oil from the top end. After seeing others with them on here, I bought some shiny new mugen pedal covers and fitted them. The only problems that I had were that the pedals were a little wider than the recess on the back of the brake and clutch pedal; a quick trim with an angle grinder and it all fitted well. Anyway, I've managed to get a good portion of the body repair complete now too. Here's some pics. As you can see, the repair area is huge due to the fire, it's not ideal, but at £350 for a quarter panel I'll have to make do. I've not managed to paint and finish it yet, but all the welding is finished, the inside is painted, seam sealed and dynax'd. and it's well protected until I can get some more time off work. I also used galvanised metal rather than normal mild steel for the repair, I've had a cut off lying in my back yard for 6 months and there is no rot at all, more pleasingly, some test welds on the piece arn't corroding either, they seem to have taken on some of the zinc. I've ordered a new rear screen trim, as that was melted, but it looks like I'm going to have to take the rear screen out to fit it, which is a bummer. Last edited by Vtecmec on Tue Mar 19, 2013 9:32 pm, edited 1 time in total. Anyway, I had a look at the oil leak on Saturday, at this point I had the intention of just resealing the rocker cover and preventing any leak. But on closer inspection, I noticed the vtec solenoid leaking and the cam seals at the belt end. Another bummer. I took off the rocker cover, and it didn’t look pretty inside. Wanting to do things properly I thought I'd give it a clean, so I soaked it in brake fluid overnight. This softened the crap a little, but didn’t do much really. I moved on and used some nitro morse to strip the old paint off the top so I could paint it. I then tried a little on the inside and it worked a treat on the crap. It still took a bit of hard graft, but the results are pretty good. And finally painted in phantom grey pearl. Now, since the cam belt's coming off, I thought I'd use the opportunity to fit the shiny cylinder head and inlet manifold that I have in storage. So, in preparation, I also gave some other bits a lick of paint. Last edited by Vtecmec on Tue Mar 19, 2013 9:33 pm, edited 1 time in total. Managed to get some more stuff done this weekend, though not as much as I hoped due to the rain. I did have some new injectors to fit, but unfortunately they are the wrong ones, obd2 5th gen injectors, so I ended up having to use the ones currently on the motor. It's pretty much ready to bolt onto the cylinder head I have stored, and the car is almost there too, all the ancillaries are stripped off, it needs just the cams and head bolts taking off. Last edited by Vtecmec on Tue Mar 19, 2013 9:34 pm, edited 1 time in total. Time to take the cylinder head off, looks so dirty . Getting the timing lined up first. Some shots of its replacement. And with the old one in the background. Last edited by Vtecmec on Tue Mar 19, 2013 9:35 pm, edited 1 time in total. The engine bays looking a little empty at the moment. I spent a few hours degreasing the engine bay today, though forgot to take any after pics. I'll post some tomorrow. I also got to finish the last of the outstanding bits that needed cleaning and painting. If the weather is ok tomorrow, I hope to build the head and intake and get it on the car, if not bolted in place. Last edited by Vtecmec on Tue Mar 19, 2013 9:36 pm, edited 1 time in total.